" Articles in Category: Brian Sandoval	"
Just hours after his Executive Order on Thursday, issued in hopes of paving the way for worse health care policies to be sold to Americans, the White House announced it would no longer pay subsidies to health insurance companies meant to help cover out-of-pocket medical expenses for low-income citizens. Over the Summer, after months of Trump threatening to cut off the so-called Cost Sharing Reduction (CSR) payments defined by the Affordable Care Act ('ObamaCare'), the non-partisan Congressional Budget Office (CBO) found that doing so would raise premiums by 20%, result in lost health care for 1 million in 2018, and increase the federal deficit by nearly $200 billion over the next decade. So, of course Trump did it anyway. The matter now moves to the federal courts, where state Attorneys General have announced they will file suit (along with the insurance companies who will likely do so as well, since they are still legally required to give customers the discounts, whether Trump reimburses them or not) and to Congress, which could pass legislation to mandate the payments be made. 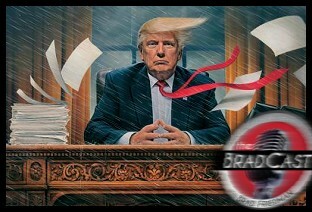 We explain what it all means, what Republican lawmakers may do next, and who will be most harmed by the President's attempted murder of the Affordable Care Act, as he tries to hoax his own gullible voters into believing it was a 'suicide'. On Friday, Trump similarly injected even more chaos into U.S. foreign policy by falsely declaring that the seven-nation agreement that prevents Iran from creating nuclear weapons was not in the U.S. interest and that they had violated "the spirit" of the deal. In order to do so, he offered a litany of straight-from-Fox-"News" propaganda about Iran and the deal that would likely embarrass even those from the George W. Bush Administration who falsely sold the case for war in Iraq claiming that they were developing weapons of mass destruction. That issue, on whether to officially end the long-sought pact --- which all other parties (Germany, France, Britain, China and Russia) all agree has been working well --- will also now goes to our broken Congress to determine its fate. But, it's a Congress with Republicans like Rep. Scott Perry (PA) who accused CNN of "making up" the still-ongoing humanitarian crisis in Puerto Rico. Amidst all of this, one leading Democrat, for what its worth, has an "urgent" idea that might end up saving the world if the otherwise impotent elected members of Congress can ever come to terms with the dysfunction they've sown and the monster they've given rise to: Take away his nuclear button. Immediately. 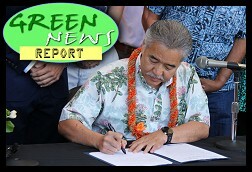 IN TODAY'S RADIO REPORT: As Trump steps back from the Paris Climate Agreement, Hawaii steps up; Defiant California partners with China on clean energy; Switching from coal to solar would save 52,000 lives a year; PLUS: Elections have consequences --- Nevada Democrats reverse anti-solar regulations... All that and more in today's Green News Report! 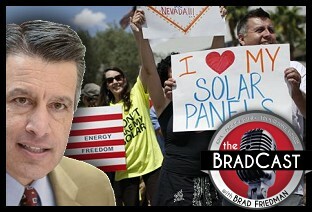 On today's BradCast: How outrageous new fees imposed on behalf of Nevada's monopoly electricity company and the state's Big Government Republicans have suddenly resulted in thousands of lost jobs, ripped-off consumers, and a mass exodus of solar companies from the state where the industry had previously been booming. What did GOP Governor Brian Sandoval --- whose top staffers are also lobbyists for the state's NV Energy company --- know and when did he know it? And how much did he personally have to do with his appointees on the state's Public Utilities Commission (PUC) ripping off solar customers by raising rates on them, while lowering the amount of money rooftop solar owners are paid for selling back unused, clean power to the grid? Lauren Randall, manager of public policy for Sunrun, which describes itself as the largest dedicated residential solar company in the U.S., and a spokesperson for The Alliance for Solar Choice the rooftop solar industry's advocacy group, joins us to explain what just happened in NV and how it has resulted in Sunrun, Solar City and several other rooftop solar companies being forced to shut down entirely in the state. That, after Sandoval had previously offered incentives to encourage private consumers to invest in clean, solar energy. "It's absolutely outrageous," Randall tells me on today's program. "The easiest way to understand this is it's a 'bait and switch'. Nevada passed incentives to attract residents to go solar, and then after baiting homeowners with incentives, the state switched the rules, penalizing solar homeowners to deliver basically additional profit to NV Energy." She says there is a "tremendous amount of backlash from both sides of the aisle on this," after "the rules were changed in the middle of the game for over 16,000 customers who went solar to save money on their electricity bills and to move the country away from fossil fuels and on toward more clean energy." During the interview, she details how her company is now suing the state to force Sandoval to release communications between himself and his staffers, the PUC and NV Energy, as the industry hopes to roll back the devastating new rules which were announced just before Christmas and took effect on the first of the year. Sandoval's commission, Randall explains, "just presented the most anti-business, anti-solar rules that we've seen, really anywhere in the country. It's been just catastrophic for families in Nevada. What we're seeing now is upwards of a thousand job losses from this." Randall is hopeful that public outrage may force the PUC to overturn their new rules that have otherwise just killed the solar industry in sunny Nevada. She charges that the effort is a "coordinated campaign" among fossil fuel-based utility companies in a number of states (and could be coming to a state near you!) and asks folks to sign up to help in the fight.